“Zainab! I won’t be able to read all the stories. I’ve read the first two – which other ones should I prioritise?” I texted frantically. In about 15 hours we were going to be discussing Daniyal Mueenuddin’s In Other Rooms, Other Wonders at the second DWL London Readers’ Club meet-up. I arrived at the Notes Café in Covent Garden, all nervous and conscious I’d be the only person who hadn’t done her homework, but I was in good company as it turned out. 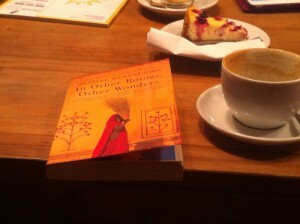 Two new faces, Kirin and Beenish, sipped on their coffees, the ochre book prominently displayed on the table so that we could all recognize each other. We had barely introduced ourselves, when Kirin and Beenish admitted they hadn’t read the entire book, and then Sumaira walked in, apologizing sheepishly for having just read the first two stories. I breathed a sigh of relief. And as the rest of the group trickled in slowly – Zainab and Nadia and Holly and Nigham – I knew this second meet was going to be a success. So there we were, sitting around a table adorned with cheesecakes and coffees, and a few signed copies of In Other Rooms, Other Wonders. A show of hands confirmed most of us had not done our homework, except Zainab, who had both her hands up for being a super prepared organizer, and Nigham, who had suggested the book, and came endearingly armed with her iPad full of notes from when she had heard Daniyal speak at the London School of Economics a few days before. 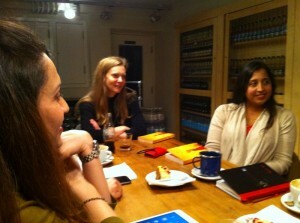 So what did we all like about the book, Zainab asked. “It takes you back to Pakistan,” Nigham nicely summed up. 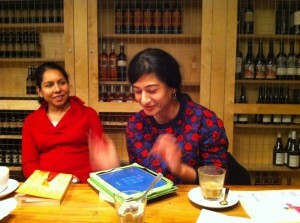 “You can picture things so vividly,” Beenish agreed. “Daniyal presents things exactly as they are in reality. It’s evocative, it’s authentic, it offers a good balance, it’s not patronizing” – and we all nodded our heads. 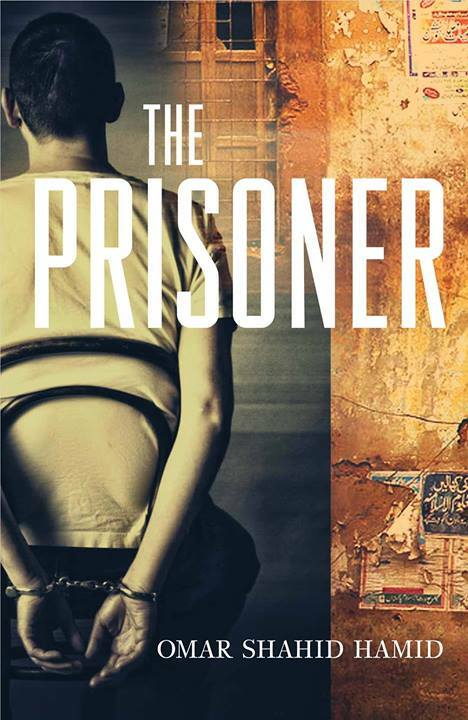 For me, personally, the book couldn’t take me “back” for I have never been, but it amazed me how this could easily be a bunch of stories set in Delhi and need no alterations whatsoever (except maybe the ease with which the most ordinary person brought out a gun every now and then). The same people, the same relationships, the same issues, the same everything Daniyal talks about exist in India. And as with everyone else, it gave me a good understanding of the everyday lives of a section of society we interact with everyday in Pakistan or India, but know so little about. A parallel universe we almost choose to ignore. So how exactly did an author who spent his early years outside of Pakistan, and knew the country as an outsider until he moved there very recently, offer such vivid and detailed insights into this stratum of society? How did he get such a deep understanding and awareness of their social lives? And would he have written about it if living in Pakistan, versus dipping in and out of the country? Perhaps one observes and perceives more when they’re not entrenched in the setting on a day-to-day basis. And what differentiates Mueenuddin as an author? It was generally agreed that he was one of the finer Pakistani writers of our time, one with the ability to put himself in the shoes of the characters and really bring them to life. But what really stood out in his writing was his realistic depiction of women, the importance given to women, the concern about unequal relationships, and the ability to be critical of his own class, but in a contained way. And the central part that romance plays in his books. And so it all came to an end, but only with the promise of another interesting book and another enjoyable conversation for our next DWL London Readers’ Club meeting. In May, we will be discussing Jeet Thayil’s Narcopolis. 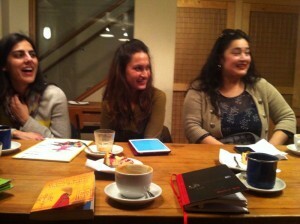 To sign up for an engaging discussion, a cup of coffee, and sugar, shoot an email to london@desiwriterslounge.net! This is a guest post. The author’s opinions are her own and do not reflect the views of Desi Writers’ Lounge. Hurray! We’ve always sort of considered Islamabad our home city, and now, with the launch of the DWL Readers’ Club in the capital, it seems things have come full circle. The club’s Islamabad icebreaker managed to gather more interested readers than any other chapter had managed so far! This can only indicate good things to come. If you’d like to sign up for the DWL Islamabad Readers’ Club or for our activities in Islamabad in general, write in to islamabad@desiwriterslounge.net. In the meantime, here’s an awesome post that writer/photographer Haroon Riaz put up on the inaugural Readers’ Club session in Islamabad. Thanks, Haroon! There were two standing ovations that night at the NAPA auditorium in the old Hindu Gymkhana. 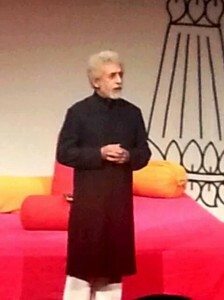 The audience first rose to its feet when Naseeruddin Shah walked onto the stage to introduce the production, a dramatic retelling of three of Ismat Chughtai’s plays by Motley Theatre, titled Ismat Apa Ke Naam. That ovation was for Shah alone, fueled by the audience’s deep respect for his work in film, and their utter delight at seeing him in the flesh. Photo credit: Syed Junaid Ahmed. This production was an experiment of sorts, Shah said in his introduction. The storytellers would employ a mix of narration and acting, with basic use of props, lighting and sound, thus creating a more full-bodied storytelling experience. Karachi audiences had previously seen a simpler version of this being put into practice by Qissah Farosh, which had inserted a basic component of acting in their performance of the works of Patras Bukhari and Mirza Farhatullah Baig, but had stayed faithful to the narrative form of storytelling. Prior to that, Zambeel Dramatic Readings had paid tribute to Ismat Chughtai’s work in a more classical narrative style. The benefits of the evolved storytelling model are obvious: it allows the narrator to interact with the audience, to react to the material while relaying it, and to laugh off mistakes – all the while maintaining the ambiance of a theatrical production. And so we saw Heeba Shah give a wide grin when she briefly stumbled at one point in her telling of Chhui Muee, a scathing critique of gender and class relations seen through the prism of childbirth. We saw Ratna Pathak Shah stop mid-sentence and chastise an audience member for leaving their cell phone on while narrating Mughal Bacha (originally published as Ghoongat), a funny and also incredibly sad lesson on love and ego. And we saw Naseeruddin Shah chuckle frequently through his telling of Gharwali, a hilarious literary treatise on the patriarchal concept of honour. Of course, given Shah’s skill as an actor, it is perfectly possible that the chuckling was intentional, but the point remains that the storytelling model allowed him to use it. Over the course of an hour and some minutes, the three actors enthralled the audience with their charged performances. My only peeve was that Mughal Bacha was narrated in too low a voice; the audience had to strain to hear Ratna Pathak Shah. But Ratna Ji also served us one of the evening’s most memorable scenes, in which she prepared to say her prayers while building up to the climax of the story. The quiet, deliberate movements with which she performed the wuzu and wrapped her head scarf created an aura of both piety and dread as we waited to hear what would ultimately become of Kaalay Mian’s and Gori Bi’s unfortunate marriage. It was testament to the strength of Chughtai’s writing and Shah’s direction that the theatrical aspects of the production never overpowered the stories. It seemed as though the Shah family was simply the channel; ultimately it was Ismat Apa whose voice emerged the strongest – unapologetic, unflinching – and that was exactly how it should have been. NAPA Chairman Zia Mohyeddin with Naseeruddin Shah and Ratna Pathak Shah. Photo by Fawad Khan. The second standing ovation of the night came when the actors converged on stage to take their bows. 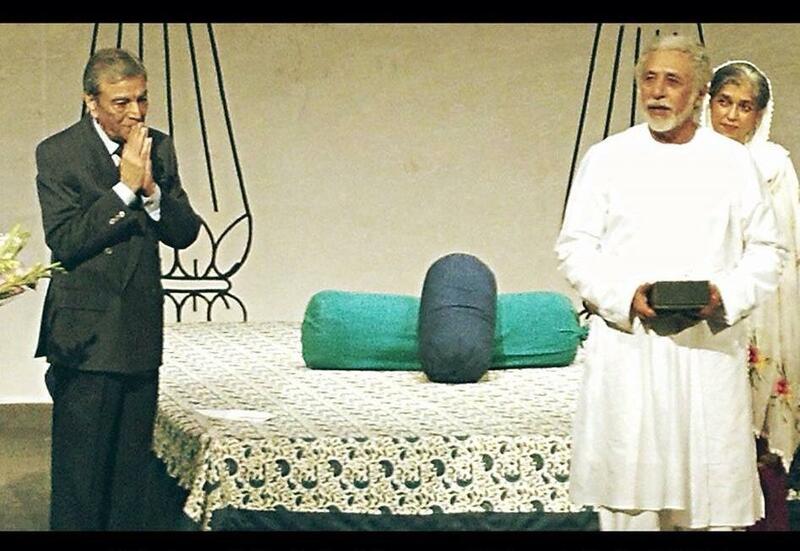 By this time, the applause was not just for Naseeruddin Shah. All three actors had, in their own way and style, owned the stories they had told. They had truly celebrated Ismat Chughtai, and in doing so they had done us a service. As Shah had pointed out in his introduction, Chughtai never got the recognition she deserved in her own country. 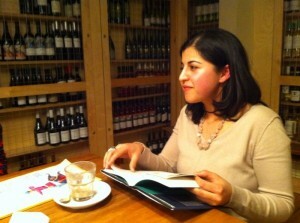 Despite her obvious literary talents and diverse body of work, she forever became known as the woman who wrote Lihaf. The stories showcased in this production demonstrated that Chughtai was never one to step back from difficult themes, but the mere implication of lesbianism in Lihaf had caused a scandal that she was never quite able to overcome in the course of her career, or indeed even after she died. Every time Motley Theatre performs Ismat Apa Ke Naam, it reclaims some of the space, inch by precious inch, that should legitimately have been hers. And for that we are grateful. The NAPA International Theatre Festival 2014 is on ’till 27th March. Get details for the event here.